In the latest YA novel by Métis writer and editor Cherie Dimaline, the world has been ravaged by global warming. Cities have crumbled from the coastlines, “breaking off like crust,” and hurricanes, earthquakes, and tsunamis have wiped out entire communities. Millions of people have lost their lives, and those who remain have endured trauma that has led to their inability to dream — with the exception of North America’s Indigenous peoples, who carry dreams in webs woven into their bone marrow. Set against a chaotic backdrop of torrential rain, food scarcity, and raccoons the size of huskies, The Marrow Thieves centres on Frenchie, a teenager on the run from government “recruiters.” Employed by the government of Canada’s Department of Oneirology, the recruiters forcibly take Inuit, Métis, and First Nations peoples to marrow-harvesting factories modelled after residential schools. Indigenous leaders have attempted to negotiate with governors in the capital, but working with the government has failed. Like most Indigenous characters in The Marrow Thieves, Frenchie finds himself nomadic and alone, isolated from his community and family, including his brother, Mitch, who let himself be captured by recruiters so Frenchie could escape. An archetypal reluctant hero of the type that is familiar in dystopian YA novels, Frenchie forms a family unit with eight other Indigenous nomads, each of whom carries the weight of his or her own trauma. Led by Miigwans – who lost his husband, Isaac, to recruiters – the group is forced to survive on limited resources, hunting with bows and arrows and guns, searching for drinkable water that hasn’t been poisoned, and building hidden camps. Together, the ad hoc family attempts to protect the group’s oldest and youngest members from harm. 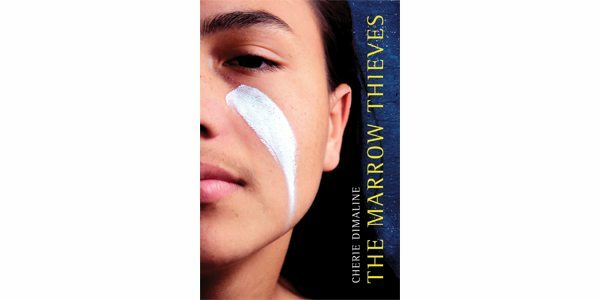 Though the novel tackles some heavy subject matter, The Marrow Thieves feels lighter as a result of Dimaline’s graceful, almost fragile, prose. “The skeletons of the green trees curved under the elegant weight of the snow, bowing and twisting like ribbons in the wind,” she writes, providing a beautiful undercurrent to a world that seems to have been damaged beyond repair. The book’s coming-of-age narrative, most notably Frenchie’s budding romance with rebellious and gutsy Rose, adds elements of tenderness and hope. Despite its title, The Marrow Thieves is not about the recruiters. Dimaline thrusts readers into the complex lives of rich and nuanced characters forced to navigate a world that too closely resembles our own. At first glance, the book appears to be dystopian fiction swarming with adventure and danger; however, readers with an interest in social justice and a grasp on colonial history will extract much deeper meaning. The book is, above all, a cautionary tale, revealing an exaggerated version of what could happen to Earth in the not-so-distant future. It is a timely and necessary read referencing pipelines, melting northern territories, rising water levels, and the consequences of government policies that don’t protect the environment. Powerful and endlessly smart, it’s a crucial work of fiction for people of all ages.